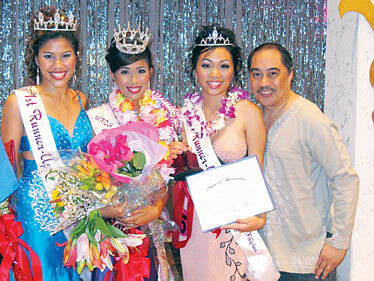 MISS TEEN HAWAII FILIPINA CROWNED: Jayna Obusan, second from left, was congratulated by first runner-up Desiree Talavera, left, second runner-up Margaret Pascual and pageant producer/director Leo Rojas Gozar after she was crowned Miss Teen Hawaii Filipina 2008 on Saturday at the Pearl City Cultural Center. Obusan led the seven contestants in the Talent, Gown and Speech, and Most Photogenic categories; she also was voted Miss Teen Friendship by the other contestants. Talavera won Swimsuit, Interview and Miss Popularity. 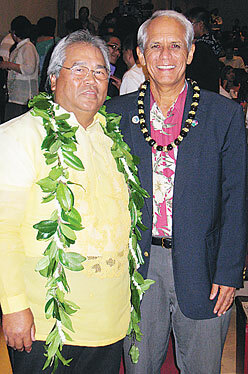 Eddie Agas Sr., left, incoming president of the United Filipino Council of Hawaii, chatted with Sen. Mike Gabbard during intermission. Gabbard represented the Legislature and presented the contestants with individual proclamations recognizing their contributions to preserving and perpetuating Filipino culture in Hawaii. Judge Daynin Dashefsky, center, was escorted by her daughter, Kylee Dashefsky, right, and Kylee's friend, A.J. Johnson. A.J. said she's concentrating on sports these days, but she and Kylee caught the eye of several photographers. 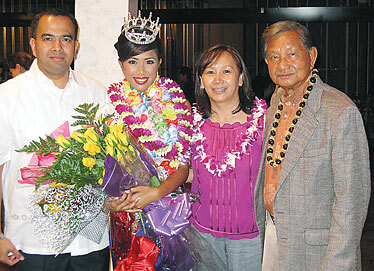 Pageant judge Javier Sapuy, left, conferred backstage with Miss Hawaii Filipina 2008 Krystle Acido and pageant emcee Patrick Koh during intermission. Koh shared emcee duties with Miss Oahu Filipina 2001 Lori Lamug. Sapuy has years of experience as an international "pageant impresario" and is looking for ways to provide pageant opportunities in Hawaii. Two-time UFCH president Jake Manegdeg, right, talked with Obusan and her proud parents, Jayvee and Wilma Obusan, after the formal program. Although only one contestant won the title, all seven gained valuable experience in becoming poised public figures while promoting awareness of the Filipino community.